This is a beautiful gift for a newborn baby and their mum or dad, a special gift that they can treasure forever to remind them of the birth of their new baby girl. 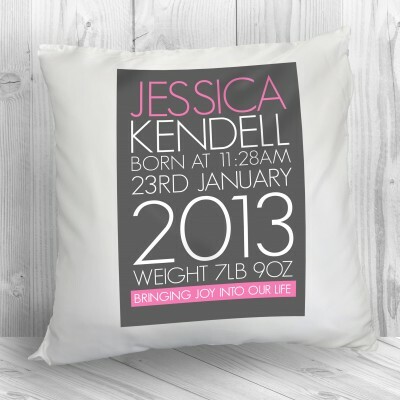 This white cushion in baby pink with grey print will blend in perfectly in the new nursery. You can also personalise with the baby's first name, surname, time, date of birth and weight to remember the key information. The text 'Bringing joy into our life' comes as standard. This item is also available for baby boys in baby blue!